If you're thinking about transitioning into the management side of sales, it might be a wise choice. Glassdoor has pinpointed sales management as the 10th best job in the country based on potential earnings and job availability. The two main paths to sales management are to move from a sales position to sales manager, or to shift from another type of management job over to sales management. The type of job you're coming from will likely determine your biggest challenges as a sales manager. This transition can be rough, especially if you're taking charge of your old teammates. You'll have to set some boundaries to make it clear that you're no longer “one of the gang" and this can be tricky and difficult. Start by meeting with each member of your team one-on-one. Go over what you think their responsibilities are. This includes giving everyone very specific goals. But make it clear that you're ready to listen to any comments or concerns they have – you want to defuse any resentments as quickly as possible before they become major issues. 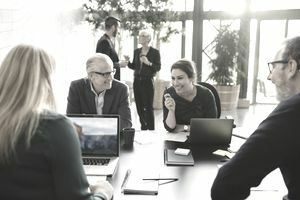 If you move into a sales manager role in a different organization, you won't have the same awkwardness with your sales team but you might still find the transition jarring. Again, you'll have to keep reminding yourself that you're now the leader. You're not one of the pack, so behave act accordingly. On the other hand, don't overcompensate by treating your salespeople like lesser creatures. It's best to hit a happy medium where you act as an authority figure but one that your salespeople respect rather than fear. You might be disconcerted by how quickly your salespeople see through your management tactics if you're a newcomer to sales. Salespeople are professional persuaders, and most will be well aware of it when they're being manipulated. Often the best approach is the straightforward one -- give your salespeople their goals, let them know you're there to help, and keep a close eye on them so you can reward top performers and step in when others are struggling. Here's a hint: Salespeople are highly rewards-motivated. They tend to be very competitive, and fostering that feeling can encourage them to produce. But you could end up with salespeople who hate each other if you overuse this approach. Always strive to keep the competition at a friendly level or you'll turn your sales team into Glengarry Glen Ross. This job is a somewhat unique blend that requires people skills on two levels -- with your team and with their potential customers -- so if you don't consider yourself to be a people person, it might not be for you. But if you are, you'll find that it can be a risky but highly rewarding career choice – rewarding in both money and personal achievement -- whatever trajectory you take into the position. If that sounds like a good combination to you, go for it. If not, a sales manager position probably isn't your cup of tea.